Professor Way Kuo assumed the role of President of City University of Hong Kong (CityU) on 14 May 2008. Professor Kuo is a Member of the US National Academy of Engineering and Academia Sinica in Taiwan, a Foreign Member of the Chinese Academy of Engineering, and a Foreign Member of the Russian Academy of Engineering, elected in 2000, 2002, 2007, and 2014, respectively. A pioneer in reliability research of systems at their infant stage, Professor Kuo is renowned for his work in designing the reliability of electronics systems and nuclear energy, and has made breakthroughs in nano-reliability research. As such, he is elected to the US National Academy of Engineering at a young age. He is also a founding member of the Academy of Sciences of Hong Kong and a senior fellow of the Institute for Advanced Study at CityU. 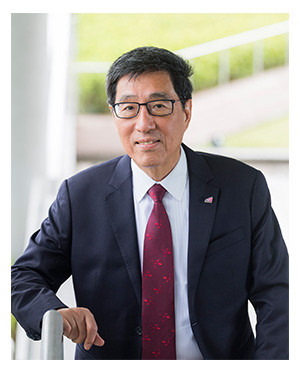 Before joining CityU, Professor Kuo was University Distinguished Professor, Dean of Engineering at the University of Tennessee (UT), and was a member of the senior management team at Oak Ridge National Laboratory, US Department of Energy. During his tenure at UT from 2003 to 2008, there was a marked increase in funds raised through the development of industry and alumni contacts. Professor Kuo dedicated his service to Texas A&M University from 1993 to 2003 in the Department of Industrial Engineering and Department of Electrical and Computer Engineering. He held the endowed Wisenbaker Chair of Engineering in Innovation and was the Executive Associate Dean of Engineering from 2000 to 2003. From 1993 to 2000, he was the Head of the Department of Industrial Engineering, managing both the Industrial and Biomedical Engineering programmes. The NRC–Research Doctoral Programmes and US News & World Report rated the department under his leadership among the best in the US. Professor Kuo received his PhD degree in engineering in 1980 from Kansas State University and BS degree in nuclear engineering in 1972 from National Tsing Hua University in Taiwan. He worked as a Member of Technical Staff for Bell Laboratories from 1981 to 1984 before serving at Iowa State University from 1984 to 1993 where he was promoted to Full Professor in 1988. He was appointed a Fulbright Scholar in 1991 and has received prestigious teaching and research awards. In addition to his remarkable academic achievements, he has received numerous professional awards, including an Honorary Doctorate from Beijing Institute of Technology granted by the State Council of the People’s Republic of China. He has also been appointed as external advisor for internationally renowned institutions, hi-tech companies and research organisations, and is frequently invited to speak all over the world on topics related to education, reliability, energy and research. Professor Kuo is the author and co-author of eight academic books and over 200 high impact papers, some of which are deemed classics in systems optimisation design and are used as the basis for establishing the reliability standards. He is well respected for promoting higher education with an emphasis on its relevance to societal needs and problem-driven research. Professor Kuo is the Chairman of the Gnedenko e-Forum based in Moscow, Russia.